Posted by Morgan in clinton, oilsands. The world’s only hope was Super Climate Clinton who faced a big decision: Should she rescue the countries trapped by the Tar Sands Monster? Or should she give in to the sleazy oil executives and approve an oil pipeline that would extend the U.S.’s dependence on dirty fossil fuels for decades to come? Executives from Shell Oil and the Royal Bank of Canada, the largest financier of oil sands extraction, distracted and mislead Super Climate Clinton, knowing that if she examined the situation she wouldn’t approve. But Clinton heard the loud calls for help from the United States, Canada, and Mother Earth. 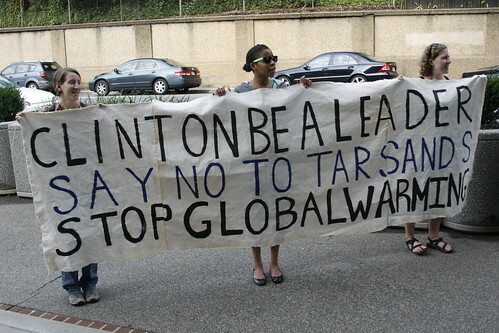 Once Clinton actually looked and saw the filthy destruction in the Boreal forests, she rescued the trapped countries, beat the dirty Tar Sands monster back and chased away the corporate executives. 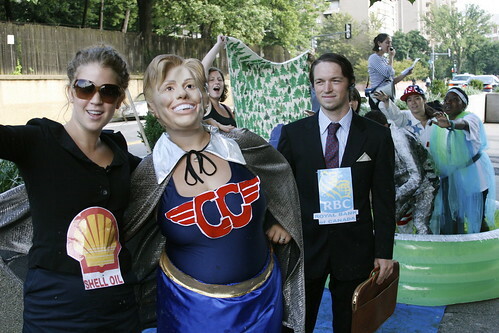 Secretary Clinton has the power to stop a major expansion of dirty oil production, but she needs to act quickly. The Obama campaign has promised a transformative switch to a clean energy economy, but his administration’s actions on mountain top removal coal mining and oil sands expansion have yet to live up to his word. Today’s action is part of a much larger effort involving the Rainforest Action Network, the Sierra Club and many more groups fighting to stop tar sands extraction.